The Back Stability: Integrating Science and TherapyTM continuing education home study course presents proven clinical approaches to stabilize the spine. It provides a foundation that will guide you in selecting the most effective exercises for each client and integrating them into a complete program to offer the best possible care in back health. You will gain the practical knowledge to help you recognize and assess inappropriate movement patterns—whether caused by injury or simple day-to-day activity—and use a process of clinical decision making to determine which exercises to use in developing effective back care programs. This continuing education home study course is offered to you in a distance-learning format, providing a logical progression from initial concepts to clinical applications. The text introduces the problems of back pain and instability and provides an explanation of spinal anatomy, movements, and the physics of lifting. A discussion follows of the basic skills required for developing stability. Assessments of posture and muscle balance are highlighted, and foundational movements for development of core stability are introduced. After covering the basics, the text moves into more practical applications by presenting progressive exercises and basic equipment used for developing greater stability. Information on abdominal training, resistance apparatus, speed and power, and practical functional progressions will help your patients or clients increase back stability and enhance performance. Finally, real-life patient examples illustrate how to structure a full back stability program. 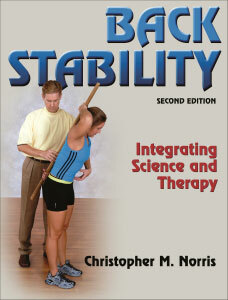 Electronic format — Back Stability: Integrating Science and TherapyTM certificate package with online test includes the eBook version of the 360-page Back Stability: Integrating Science and Therapy, Second Edition book by Christopher Norris (accessed through Adobe Digital Editions/BlueFire Reader) and a 106-page workbook provided in PDF format. Instructions for completing the 100-question multiple-choice online test and obtaining CECs are also included in PDF format. Note: This course package is made available for immediate access and download after purchase. All materials for this electronic format course are available electronically. Nothing is mailed.